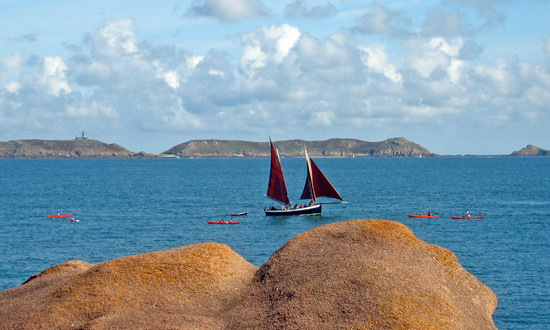 Sailing is the number one sport among Bretons, which is no surprise considering the pristine location, the nature of the beaches and the windy weather. So as spring approaches, many hobby sailors might want to turn their heads towards Brittany on the west coast of France. Generally a hotspot for all kinds of water sports, sailing is particularly enjoyable thanks to the wide-ranging infrastructure in the area. There are more than 100 sailing schools and boat hiring centres, where even newbies can dip their toe in and try their hand at this fantastic sport. The main sailing centres are called Bretagne Stations Nautiques and are located in, among other places, Saint-Malo, Perros-Guirec and Pays de Lorient. There, visitors can engage in a wide range of activities, such as group trips and catamaraning. The city of Brest is a good starting point for any stay in Brittany and is also a very popular spot for wind surfers. To get to Brittany, you can get a ferry from Dover to Calais with your car and drive along the coast – granted, it will take you about five hours, but it will be one of the more scenic drives you’ll have this year! With the end of winter comes the start of spring and as people are dropping off the detox wagon, the time has never been better to start up a new hobby or resurrect old ones that somehow got laid by the wayside. 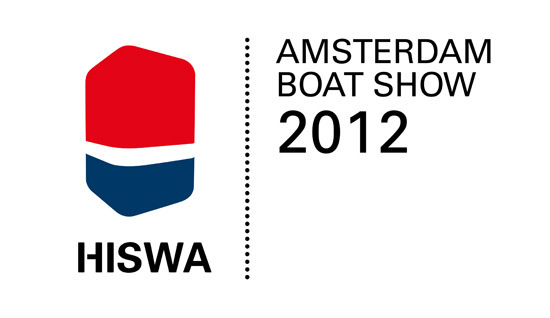 In early March, the HISWA Amsterdam Boat Show offers a great opportunity to remind yourself what you used to love about sailing (if you’re a veteran) or, if you’re a newbie, get a taste of what lies ahead. This fantastic, wide-ranging exhibition marks the beginning of this year’s sailing season. From 1st to 6th March, more than 350 exhibitors will set up shop in the Amsterdam RAI Exhibition centre to engage around 50,000 visitors in a number of activities, workshops and displays. Last year, there was an artificial Wavesurfer, where visitors could try their hand at wind surfing under the watchful eye of Olympic silver medallist Marcelien de Koning. Visitors could also check out the latest developments in the sailing world: from new navigation equipments to glow-in-the-water rescue jackets, the HISWA Amsterdam Boat Show was a great place to get excited about braving the waters of the world. Tickets for last year’s event cost between €16 and €17.50. Check the HISWA website for up-to-date ticket information. The way to Amsterdam is short, thanks to P&O Ferries: you can take a ferry to the Dutch P&O port in Rotterdam, from where it is a short drive or train ride to Amsterdam. The days are finally getting longer, which means the beginning of spring is crawling ever closer. This time of year generally means anticipation for the various carnivals, but for those who find these celebration a bit tiring in their all-out debauchery and retina-burning costumes, Brussels is putting on a more cerebral but equally fun festival. On 3rd March, the Museum Night Fever will see more than 20 Brussels museums open their doors from 7pm to 1am to create a uniquely modern, funky vibe across the city. Celebrating its 5th anniversary this year, the Museum Night Fever is squarely aimed at the young & hip people of Europe. 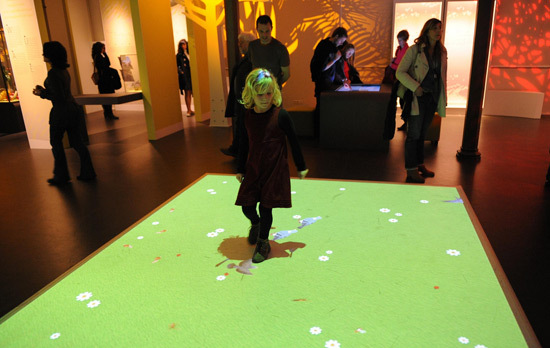 Last year, 14,000 visitors descended upon the Jewish Museum of Belgium, the Belgian Comic Strip Centre, the Museum of Natural Sciences and many more. The Museum Night Fever is organised by the Brussels Museum Council and around 500 volunteers, drawn mostly from the art scene in Brussels. They set up a cultural programme extending to DJ sets, performances and workshops as well as afterparties in various clubs and bars. This promises to be a superb event, so we thought we’d give you an early heads-up to book your P&O Ferries tickets in advance. You can travel to Zweebrugge from Hull for as little as £90 each (leave on 2nd March, return on 5th, with three adults and one car). Tickets and a detailed online programme for the Museum Night Fever in Brussels will be available here from 6th February onwards. 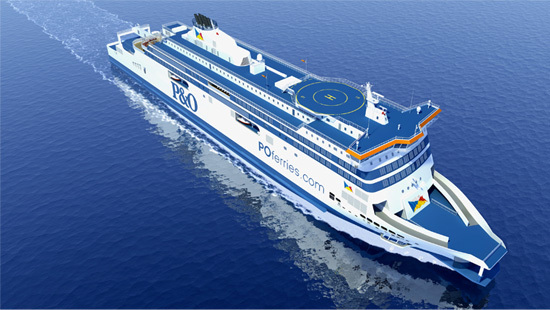 P&O Ferries has announced that it will be taking delivery of the hotly anticipated state-of-the-art new ship Spirit of France. The Spirit of France will be officially handed over to P&O Ferries on Tuesday 24th January at the STX Europe shipyard in Rauma, Finland. It will then begin the long 1400 mile journey across the North Sea to Dover, where it is scheduled to arrive on Saturday 28th January. Under the command of the senior master Captain Steve Johnson the Spirit of France will join up with its sisiter ship The Spirit of Britain. The two ships combined represent a step change in the level of service and capacity offered to cross channel ferry passengers. At more than 43,000 tons and 213 metres in length, they are not only the largest ferries ever to work the Dover – Calais route but also the most technologically advanced. When the Spirit of France and Spirit of Britain begin working together it will represent the realisation of the largest ever inward investment made by P&O Ferries into its shipping fleet, at a combined cost of €360 million. The Dover – Calais route is officially the busiest shipping channel in the world with over 500 ships per day passing through its waters. The combined capacity of these two ships alone will amount to a staggering 3750 passengers between them. After the demise of P&O Ferries’ cross-channel rival, SeaFrance, the arrival of Spirit of France represents a welcome boost for the Dover to Calais route as P&O Ferries continues to bolster the capacity of this vital link between Britain and mainland Europe. Utrecht has started its preparations early. Since mid-2011 Trajectum Lumen has illuminated choice parts of the historical city with aesthetic light displays created by artists in the little known field of light-art, from all across the world. Trajectum Lumen is the name given to these displays, there’ll be switched on for the public’s enjoyment until 2018, when Utrecht is given the honourable title of Cultural Centre of Europe. The lights are on 365 days a year as soon as the sun goes down, so if you’re planning a stay in Belgium it’ll be well worth a night time jaunt through Utrecht. Trajectum Lumen makes for a novel way to see the city. You can download a map from their You can find out more about it here. and go about looking for yourself or get on one of the pre-arranged tours and get a bit of the city’s history whilst you look around. Trajectum Lumen also offers private tours for groups of up to 20 if you plan to go as part of a large party. 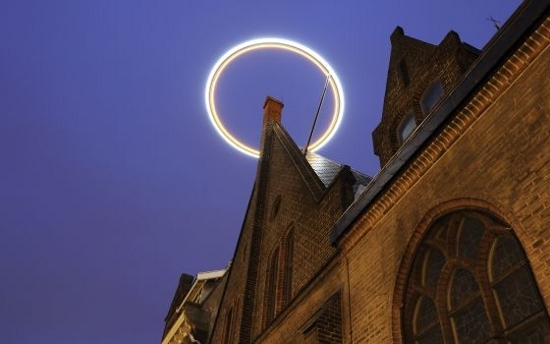 Over the next few years more and more works of light-art will be added to Trajectum Lumen especially next year which will bring celebrations of the 300th year anniversary of the Treaty of Utrecht. Still got the January blues? They say that the best way to make it through a busy/joyless/cold (delete as applicable) is to have something to look forward to. And what better to look forward to than a little jaunt across the channel? No matter whether you want to do a spot of cheeky shopping, sample some local food or just hear another language, mainland Europe is always just a short trip away thanks to P&O Ferries. As a sweetener for that early 2012 slump, P&O Ferries are currently offering their passengers a great little treat. 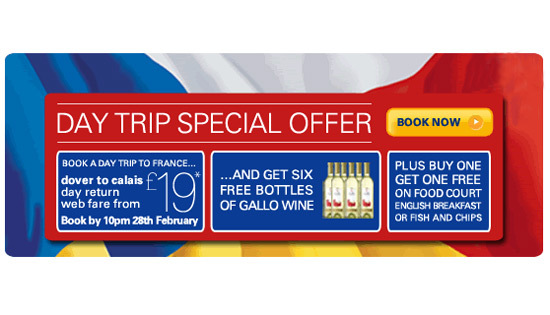 On your next trip to Calais, you could receive 6 completely free bottles of quality Gallo wine (you can choose between red, white and rosé). This could go towards your overall wine haul from France, or you could save it for the warmer spring evenings. You would also be the recipient of a ‘2 for 1’ voucher for either a Full English Breakfast or a portion of Fish & Chips in the onboard Food Court. If that won’t make for a great trip, we’re not sure what will. These promotions are available for trips from Dover to Calais at either £19 (on Sundays, Mondays and Fridays) or £24 (other days), for a car and up to 9 people. They are valid for trips booked and embarked on before 28th February, excluding travel on 11th, 18th & 19th February. Go here to get your tickets now! If one of your new year’s resolutions is to get more cultured, then you should consider putting the Brussels Antiques & Fine Arts Fair on the itinerary of your next P&O Ferries trip to mainland Europe. Don’t be put off by the name – the BRAFA might contain some of the most precious pieces of art in Europe, but that doesn’t mean non-art buyers won’t be able to appreciate the beauty and craftsmanship on display. On the contrary, it might be the gate to a more thorough appreciation of European art. 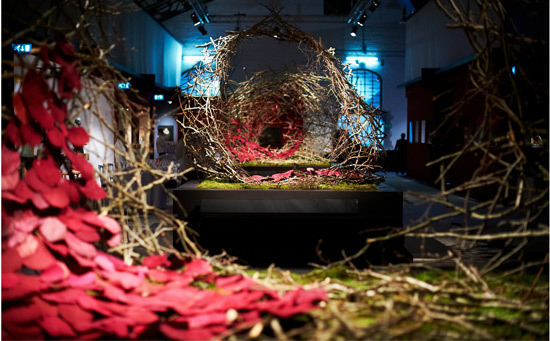 On 14 000 square metres of exhibition space in the renowned Tour & Taxis (Avenue du Port 86 C/B) complex in Brussels, current and future art fans can marvel at the hundreds of artworks showcased by exhibitors from all over the world. The French exhibitors Galerie Berger, for example, will showcase their selection of intricate 17th and 18th century furniture. Elsewhere, Galerie Ludorff from Germany will give visitors the chance to marvel at some of their incredible artworks, which focus on German expressionism and contemporary art. Modern paintings and sculptures, ceramics, photography as well as African and Oriental art, tapestry and jewellery will be on display from Saturday 21 to Sunday 29 January. There will be the chance to take daily guided tours and to relax in the magnificent restaurant and bars adjacent to the art fair. The Brussels Antiques & Fine Arts Fair takes place in the heart of Brussels, which is easily reachable from P&O Ferries port Zweebrugge (60 miles by car). With Brusselicious drawing all eyes to Belgium’s capital it’s very easy to forget the Port city Antwerp. This metropolis has historically been a site of world trade, its central location made it strategically important for naval operations. Whilst food lovers will be flocking to Brussels this year to be entertained as well as sample gourmet cuisine if you want to avoid crowds why not head to the coast instead and make the most of the fresh good delivered to Antwerp, it’s rich culinary history will tantalise your taste buds and you won’t have to wait as long as you would at the Brusselicious food festival. Alternatively if there is a specific event you want to attend in Brussels but the rest isn’t to your fancy then you could quieten things down afterwards and journey north to Antwerp. 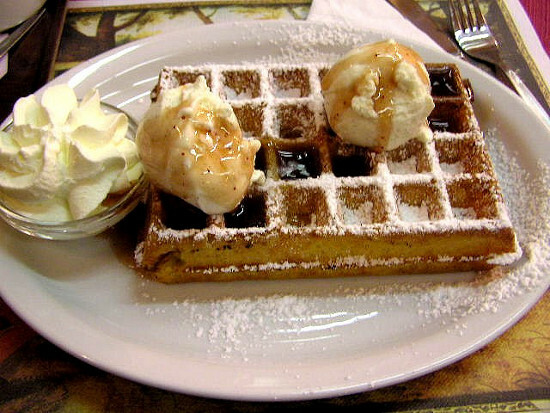 We’ll start with the obvious; Belgium is famed for its chocolates, amber-hued beer and waffles that should really be a class C drug. But as a Port City since the 16th century Antwerp has seen an influx of exotic seasonings and spices, people from all across the world have brought new dishes and ways for cooking to Antwerp making it a hub of diversity with all an abundance tantalising menus so you can find whatever tickles your fancy or just go for something new. It’s highly recommended you try out the seafood dishes; Belgium is famed for its mussels, you shouldn’t pass up the chance to try fish dishes. Belgium has its own Shrimp Fisheries so you can have them in abundance all over the country. So don’t let your tongue suffer this January, a P&O Ferry will get you to Belgium so you can enjoy all the cuisine of a world port like Antwerp!